Thinking about starting a business? 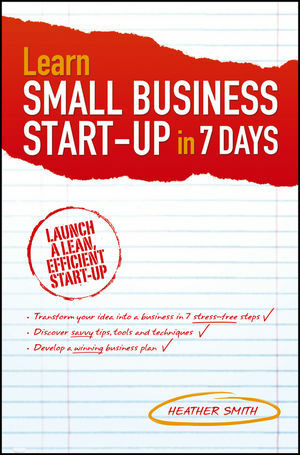 Then Learn Small Business Startup in 7 Days is the book for you. Guiding you through the key aspects of getting a new business up and running, from a self assessment about whether you are really prepared, through to finance, marketing, and legal issues, highly sought-after small business commentator Heather Smith covers it all. Carefully explaining everything you need to know to efficiently and effectively start a business, the book comprehensively covers the basics in 7 chapters, one for every day it will take you to get ready to leave the rat race and live your small business dream. profitability. Heather is a popular speaker and media commentator on all things small business. For further information and bonus resources, visit www.HeatherSmithSmallBusiness.com.